Hill's™ Science Plan™ Adult Light with Tuna comes with in a variety of sizes and is either wet or dry depending on which best suits your cat. Tuna naturally contains fish oils which are excellent for joint care, health skin and a shiny coat. It is also delicious and you can be assured that even the fussiest cat will enjoy this food! Fibre Increased Provides more dietary bulk which helps reduce hunger. Formulas 3 Pouches, 2 Dry, 1 Canned Increases choice to encourage acceptance. Ingredients: Tuna: Maize, maize gluten meal, chicken and turkey meal, brewers' rice, cellulose, tuna meal (9%), dried beet pulp, animal fat, pea bran meal, minerals, digest, taurine, vitamins, trace elements and beta-carotene. With a natural antioxidant (mixed tocopherols). 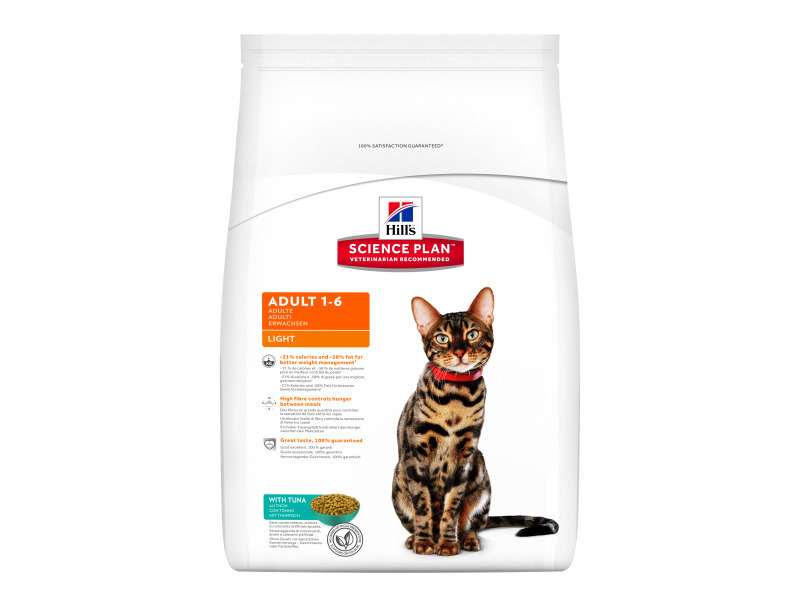 There are currently no questions for Hills Science Plan Adult Light Tuna Cat Food - be the first to ask one!